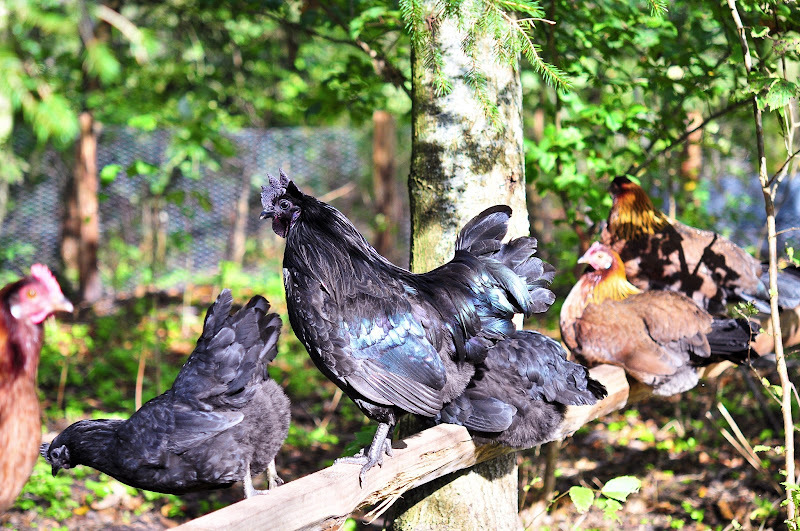 we started off with 12 chickens - 9 hens, 3 roosters, two breeds - swedish blacks and the danish landrace. that was back in summer 2011. the next summer, they began to nest on their eggs and made themselves some more chicks. those were a blend of the two races, as you can see in this photo...combo chickens and rather unique-looking. at the beginning of the spring season, we had approximately 30. husband took out a couple of roosters because they were driving us insane with all that crowing. oddly, they literally had a pecking order and didn't fight with one another. but that's because we've got plenty of room. initially, we were sure a fox had struck. there were about 15 separate piles of feathers here and there around the henhouse and garden and the henhouse itself was filled with feathers, as was the little nesting addition on the back of it. there wasn't a trace of a chicken or a single drop of blood. we were strangely impressed that a fox could do that. we expected that a bunch of the chickens were scared off and would show up again in the next few days. so we waited. and waited. and had a friend with a hunting dog come by to try to flush them out. nothing. we talked to a lot of people. all of them were skeptical that a single fox or even a fox with a few pups could take so many chickens so bloodlessly. even the four little ones who were out in the other barn, far from the henhouse were gone. and to my knowledge, they had never been over with the main flock, so how could a fox know to go over there and take them? and so we got to thinking. the day before they disappeared, a middle-aged danish couple came to look at some rabbits we had for sale on dba.dk (an eBay owned sales site that's more like craig's list than eBay). they pulled up in a rather battered black station wagon. the woman was very interested in checking the bunnies (there were still five left at that point) to see whether they were boys or girls (this is a nearly impossible task). so while she and i and sabin turned bunnies upside down and tried to see, the man wandered off, disinterested in the task. in the end, she decided it was too risky and she didn't buy a bunny and they got in their car and left. we departed soon after to go to the movies in vejle. it occurred to me later that i had told the "bunny people" that when they made an appointment - telling them they had to come before six, because we had somewhere to be and had to leave at six. so they knew we weren't going to be home that friday evening. there are a lot of summer markets around in denmark and we think our chickens are going to be appearing at one (or more) of them. the big one is next weekend and we're going to go check, as our chickens, with their blend of the two races, are pretty distinctive. we have also reported the theft to the police and oddly, it's not the only reported chicken theft in the area. there are chicken rustlers afoot (thanks bill, for reminding me of that word). unfortunately, i had enough calls afterwards (and before i got to thinking about it) that their telephone number disappeared from my phone, but i am sure it had to be those "bunny people." the woman remarked on those 4 young chickens out there in the barn and how much fun they appeared to be having pecking around in the horse's stall. it took someone who knew they were there for them to disappear with the rest of the flock. and it explains why there was only feather carnage and no actual carnage. it also explains why our chicken-catching net wasn't where we left it. many of the people we talked to suspected eastern europeans as the culprits and tho' we don't really know for sure, the people who came to ostensibly look at bunnies were as danish as could be. so it seems that anyone can be a thief. You need your own TV series.....waiting with anticipation for the next episode! Now, saying you find them at the market what is your next step? @Jody, that would be fun! and lately there's been plenty of fodder for a t.v. show around here! @Chris, I don't really know, but I think I'll confront them. It's all very hard to prove, of course, but because they're a blend of the two breeds, they're pretty distinctive. Talk about being bold as brass and stupid at the same time! If they would have only taken a few of them you would have let it go in the name of a fox. Now they are going to have a lot of explaining to do! Go get um! And good luck. Dang! That is so lame. People make me mad.